Imagine that instead of plugging along on a treadmill in the gym you are running up a warped wall like one of those ninja warriors on television. Or, instead of pushing yourself into downward facing dog in yoga class you are climbing up a salmon ladder. In December, you could be one of 100 athletes who gets to compete in JuggernautX, the first competition ever in Florida that combines elements of high intensity functional exercising, obstacle course racing and ninja warrior training in one hellacious competition. A juggernaut is a large, destructive force that crushes whatever is in its path. JuggernautX is designed to test your ability to overcome that overwhelming force. JuggernautX will be the first competition in the 941 area that truly assesses the functional ability of athletes across different fitness planes. The event will have four stages. In each of the first 3 stages, only half of the competitors will move forward. The top three male and female athletes who perform the best in the four stages will win prizes and awards. The top competitor will be crowned the first ever JuggernautX Champion. Each stage will feature exercises common in functional fitness training like CrossFit, boot camp workouts and HIIT. This could be barbell, dumbbell or kettlebell movements, wall balls, pull ups, double unders and more. In addition, each stage will also feature ninja warrior obstacles that must be crossed, climbed, traversed or endured. These could be the monkey bars, heavy rope jumping, climbing walls, rope climbing, swinging from one apparatus to another, and the famous warped wall. Because it’s the first event of its kind in Florida, it is expected that a number of athletes who have competed in televised shows such as American Ninja Warrior and Spartan: Ultimate Team Challenge will attempt to master the four stages. The question is—can you beat them? JuggernautX was created by Dale Lively, owner of LIVE Training Center, and Jason Cross of Fit941 to highlight the convergence that is now taking place in these immensely popular sports. For example, in the 2017 CrossFit Games, which are the world championships for the sport, the competition featured an obstacle course event for the first time. It was amazing to see athletes who are among the fittest in the world struggle with portions of the course that required balance, finesse and climbing skills. Similarly, the finals for the latest season of American Ninja Warrior involved lifting heavy structures off of the ground and much more hand, arm and shoulder strength than ever before. It is clear that each of these workout regimes is borrowing elements from the other in order to bring the athletes to the next level. JuggernautX will test how well athletes from each of these sports does when faced with unfamiliar elements from an alternative sport. JuggernautX will begin at 8:00 am on Saturday, December 16, 2017. The competition will take place at LIVE Training Center, at 1731 12 St. E, Palmetto FL 34221. 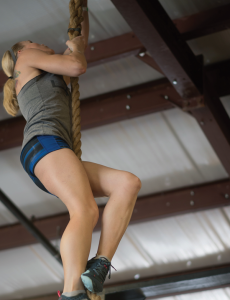 The owner of LIVE Training Center, Dale Lively, is an accomplished Obstacle Course Racing winner and Personal Trainer certified through the National Academy of Sports Medicine (NASM). His Palmetto facility has been featured in national media as a training center for the American Ninja Warrior television show. LIVE Training Center offers OCR and Bootcamp training for kids and adults of all ages and abilities. JuggernautX only has space for 100 athletes. Each athlete will compete the stage one at a time. Registration has already begun. To register, visit Fit941.com, LIVETrainingFL.com, or call 941-729-5217.